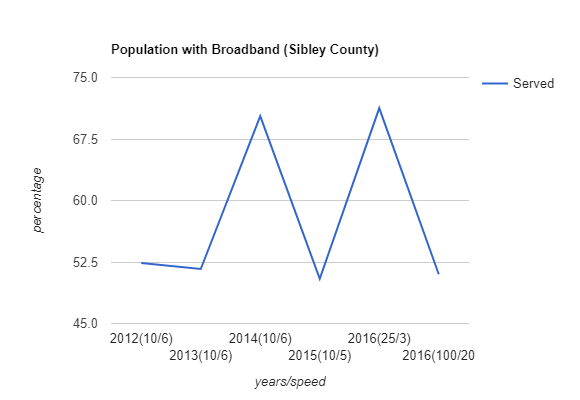 Sibley County has been working (in partnership with Renville County and area towns) on broadband for more than 10 years. Early on in the process, they decided to focus on getting fiber to the farm because, despite the higher cost, they wanted to ensure that everyone got access. The original plan was to work with the local governments but they had trouble reaching consensus with all communities. That opened the door to a new solution – a cooperative. RS Fiber was born. Phase 1 of the project had the 10 cities commit to a $8.7 million Generally Obligated Tax Abatement Bond in the form of an economic development loan to the RS Fiber Cooperative to construct the fiber backbone connecting the cities and a FTTH network in each community. In Phase 2, which could begin in 2019, the 17 townships will be asked to loan $5 million in G.O Tax Abatement dollars to the cooperative to begin construction of a fiber to the farm network. The cooperative will make the bond payments on behalf of the cities and townships. The cooperative will borrow another $42 million from various bank sources to construct and operate the network. RS Fiber hired Hiawatha Broadband Communications to manage the network build-out, operations and marketing. As they build out their fiber-to-the-home network, RS Fiber is offering fixed wireless services (50 Mbps down and 25 Mbps up) to customers to hold them over until fiber is available. The build out continues, and as it does it impacts the local community. Knowing that access is only half the battle, RS Fiber focused attention on building broadband demand by becoming a Blandin Broadband Community (BBC). They worked together to create a plan to increase demand for and use of broadband in the community with classes for the community, including computer basics and more specialized classes; they distributed computers to low incomes households; they created an Innovation Center in Winthrop with things like hotspots, broadcast technology and a drone obstacle course. RS Fiber has also become a US Ignite community, a national effort to encourage communities who have Gig access to make good use of it. As the chart shows, the RS Fiber network is still under development. They are actively building and should see more improvements in the next round of mapping. How is Sibley County Doing? We met with representatives from Sibley County at the Winthrop and Gaylord courthouses. The group was led by Mark Erickson, who has been involved in the FTTH project in the area. The network is still being deployed and digital inclusion efforts are underway, so there’s a lot of learning going on, but a major reward is already in their sights; a medical school is looking to open in Sibley County in 2018. Sibley County’s lead partner, RS Fiber, has received national and state awards for their work in bringing broadband to an area that’s hard to serve. They have received the Cornerstone Award by the industry publication Broadband Communities, National Association of Telecommunications Officers and Advisors’ (NATOA) Community Broadband Innovative Partnership Award and City of Excellence Award from the League of Minnesota Cities. A medical school is planning to open in Gaylord in 2018. Easy access to Minneapolis and St. Paul and the rural location were selling points for the Danza Group when looking into the medical center, but broadband was a necessity. The medical school is expected to have an enrollment of 600 students. It will add at least hundreds of professional and support service jobs to Gaylord and surrounding communities. The Gaylord City Council and the Danza Group plan to work together to stimulate the local economy, as other businesses related to medical education open offices in Gaylord. Winthrop News is Winthrop’s local newspaper. Before upgrading to the RS Fiber broadband connection, it took 30-60 minutes to upload the paper to the printer. And often that connection timed out, which often put them in danger of losing their printing time slot. Now it takes minutes to upload. It used to be difficult to have two people working online at the same time. Now they are looking at building a website and using live video. They have started to use Facebook and find they are able to reach the 20-30 year old demographic that wasn’t reading the weekly newspaper. They are working on monetizing the effort. The City of Winthrop is upping their social media profile. They are active on Facebook and created a mobile app (Winthrop on the Go) to promote the city. They app has been downloaded more than 500 times and by many people from outside the area. It’s a good tool to promote tourism and recruit new residents. Fiber is still being built in Sibley County. Some towns have it, some don’t. At least one happy grandma reports that her grandson has moved his computer to her house for better gaming. His family back home doesn’t mind as it helps their speeds at home to have him off their connection. Access for the farms was a goal for Sibley County. It would have been cheaper to focus only on the cities and towns with higher population density, but they knew farmers would use it too and they are. Farmers are using the fixed wireless solution to monitor the fields at work and the house when they’re away.